Looking for interior painting ideas? 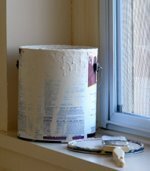 This section is about the creative part of interior painting - but on every page youll find links to DIY painting info - so you can match your ideas to the practical situation youre in. Making an interior painting design is a creative process that takes some time. 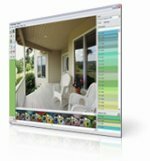 House paint software can be helpful, in visualizing your results. In this software, you can color your own pictures with available interior paint colors, and see how your own spaces will look in new colors. When choosing paint colors, first get lots of samples - but decide on paint colors only after having decided on furniture and flooring. It's much easier to adjust your paint colors to your special furniture or flooring, than the other way around. 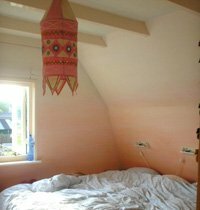 When forming your interior painting ideas: think of the kind of paint nou need for the kind of surface you are painting. Painting over wallpaper, laminate or wood all need their own kinds of paint, with their own look. Als the paint sheen you choose defines a lot of the final look and feel. 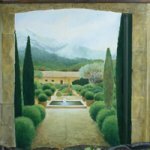 Finally, look at the state of your painting surface - is it smooth or chipped? If walls have structure, that's a big factor, in terms of styling. Painting is not the only way to spruce up your walls. You can also use wallpaper or Wall stickers. Most wallpapers and stickers can be taken off without leaving a trace. When you use wallpaper, or a wallpaper mural, you might not have to paint at all. When you make your design, remember: paint is not only color. A lot of a paints' look is defined by the sheen, and the capacity to level out. Chalky latexes show the brushstrokes, but high-gloss enamel paints level out and make a shiny surface. Both paints however are affected by the color you paint them on - click here for interior painting tips on underlying paint colors. If your already bought paint somehow doesn't look good after all, you can make things right by manually adjusting your interior paint color to the available light or to your other colors. Are you in for some adventure? The best painting idea for you would be based on your own situation and wishes - and if you don't hire a designer, you'll have to do that yourself. But you can. There are ways to build ideas like that, even if your mind seems blank at the time. Click here for making your interior painting design. On this site you'll also find interior painting ideas about color laws and effects. Also in terms of making a design, there are several regular guidelines: Use them as tools, or materials to work with. Build your own design with them, or check your design before you start your paintjob. Following the rules doesn't guarantuee results, but taking the process step by step (and checking your choices afterwards, with the rules as tools), will make sure you'll have lasting results. 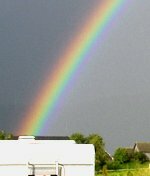 In choosing paint colors, there are all kinds of aspacts to take into account. But no matter what colors you choose, it's good to adjust them to the available light. Old paintmakers used to add a little color to the paint colors their clients chose. They manually adjusted the color to the color of the daylight, which is defined by the position of the windows (light from the north is bluish, light from the south more orange). This adjusment doesn't change the color, but gives it a pleasing 'ooze'. 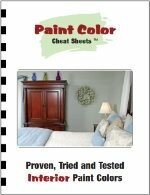 For an easy step-by-step guide in choosing paint colors, consider using the Paint Color Cheat Sheets. This guide was developed by a color consultant, who works together with a painting contractor (her husband). She found that some paint colors are just wrong, while others are always 'right', in the proper lighting situation. 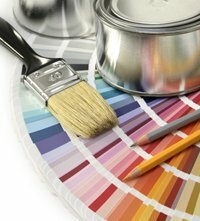 Click here for a review on this guide to choosing interior paint colors. Considering the mood-effects of color might be a good idea to get some interior painting ideas. Colors have more effect on the physical body than directly on the mood, but they surely give suggestions to your mood. You can use these effects to sustain the function of your soon-to-paint room. Yellow is great as a mood-mender. Green is great for creating a place where you can think. It sooths your senses and gives you serenity. But for sleeping, purples and pinks are better. Red can be great or terrifying, all depending on the kind of red, and where you put it. Blues can be radiating like paradise, or hopelessly depressing - depending on how you paint them. Browns can be cold, warm, dirty or glowing. Greys can be interesting, or horrifying. One element of black can be just the thing you need for your interior, especially when if you have a colorful interior. Then last, some interior painting ideas on health. If you want a 100% non-toxic paint for - let's say - the nursery, your kids' rooms, or bedrooms, consider milk paint, or making egg-tempera paint yourself. Caseine paint is a good option too, although slightly less harmless than egg-tempera (you can't eat it). 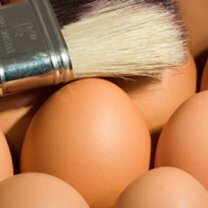 Both casein and egg-tempera are good for walls, on a latex or plaster base. Egg-tempera and caseine-paint are of the oldest use. They give a beautiful and natural look, and you can make them yourself. 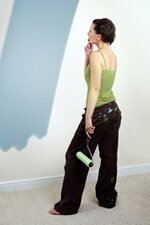 Choosing paint colors will be more complicated (you'll need to do your own mixing - click here for mixing colors), but if you take your time to try things out, it might be a good project, that will give you the most satisfaction in the end. But there are also good eco-safe alternatives that can be color matched in any color of any brand that you like. 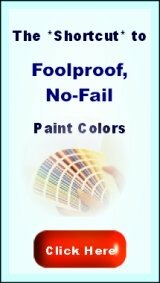 Click here for info on non-toxic paint, and here for low-voc paints.